This orchard property, comprising crown allotments 20 + 21 Section D was situated on Stoney Creek Road, opposite the Pine Grove Hotel. It had been planted as an orchard before the First World War. Financed by Miss Farrington, a family relative, Alfred Peters, a masseur, bought the property in 1918, and bred some pigs there. 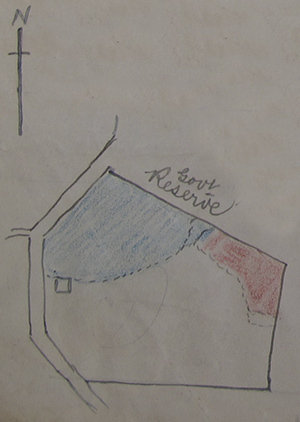 The property, then known as "Inchkeith" had been specifically acquired for the purpose of selling it to the Closer Settlement Board, so that his son Austin could take out a lease on his return from France. Austin Drummond Peters had been trained as a masseur by his father, before he joined the armed forces at age 15. His parents gave consent, and he claimed that he was 18 years old. He returned from France in early 1919 after 3½ years of service. On his application to the Closer Settlement Board, he stated that he had the full support of his father, who would help him out running the property, by paying a local orchardist to work the farm until he was ready to do it by himself. At this stage there were about 1000 trees on it. Before being invalided home, Austin had been wounded twice, a bayonet wound to the right arm and a gunshot wound to the right knee. He was also laid up with trench fever for six months. Numerous letters of support, some from local orchardists, for Austin taking up this block of land were written to the board, even by people who barely knew him. However, the valuers found that only about 5 acres of the property had good soil, and that the orchard trees were not much good. Further, as the fencing was generally in poor order, they would not recommend the Board to purchase the property. The vendor had initially offered the property for £1480, but by August 1919, she wrote to the Board stating that she would accept £850 which was the value of the mortgage which was due shortly. A moratorium clause, while the land was on offer to the Board, was all that prevented the mortgagor repossessing the property. Peters then had his orchard pruned and ploughed. On a further inspection in September, the Chief Orchard Supervisor stated that he could not understand how local experts on orcharding could have recommended the purchase. The inspector noted that only vast quantities of manure could improve the orchard, and that this was impractical due to cost. At their next meeting the Board declined the purchase. The Peters were desperate to have the property taken over by the Board, so kept their pressure up. A suggestion to inspect the property to see if an orchard could be planted in a different part of the property required a further inspection. This inspector considered this a possibility as long as the area was drained, which Mr Peters agreed to undertake. In November Peters resorted to write to the Minister for Lands directly, asking him to intervene, stating that he had been patient up to now, and that he believed that his son deserved to be allocated this orchard. He felt that he had been treated badly, as the war had made it impossible for his son to work in his learned profession, and the money he had spent on the property already would be lost, making him penniless. As a masseur, Peters treated some high ranking members in government, and may have vented his displeasure to them also. Two more inspections followed, and although only one of them was slightly positive, the Board now agreed to purchase the property at the price of the mortgage. Within two years, however, Austin was working four days a week at his father’s business in the city. He promised to sever his connection with his father’s establishment and devote his time to the orchard. By the end of 1923 the board was informed that the property had not appreciated any value, and that the lessee had in effect abandoned the property. The non-payment of an instalment gave ground to cancel his lease. Austin Peters was employed as a masseur at Salisbury House after he lost his property. In early 1924 the Board had found a replacement settler, another returned soldier, Clive Dana Colles. Born in Collingwood, Clive was brought up on a farm near Scoresby and attended the old Eumemmerring School near Dandenong. He was grandson to Captain Dana, a close friend of Governor La Trobe, who was commandant of Victoria’s first Native Police Force, established on the old Police Paddocks at Rowville. At age 20 Clive enlisted and served in the Boer War. In 1914 a gun accident in rural Western Australia saw a bullet pass through the seat of a buckboard carriage he was riding in, pierce his larynx and lodge in his neck paralysing him. Upon the bullet being removed he retained movement, and he subsequently re-found his voice by ‘drilling (yelling at) the gum trees’ on his farm. Rejected twice from enlisting for World War I on account of his lack of voice, he was accepted mid-1915 and went on to serve in Palestine (Light Horse Engineers Regiment) at age 37. He already had a connection with Upper Beaconsfield being married to Major-General Morris’ sister Gwynneth Clara Morris. The Morris family resided on Foott Road. They married in New South Wales at Wahroonga in 1915, and spent time on land at Abbington Stud near Armidale NSW before taking over the orchard in 1924. His maturity and farming experience made him a much better prospect to succeed than Austin Peters. Initially he successfully farmed the orchard and some poultry (including a petition in 1936 to the Chief Commissioner of Police for protection against picnickers stealing apples). But by 1937 his ill health prevented him from doing much manual work and by 1942 the orchard had been removed except for 2.5 acres and he was agisting the rest of the property. He was able to hang on and managed to purchase the property at the beginning of 1945. They promptly sold out to the Beggs and moved to Jervis Bay, only to return to Upper Beaconsfield, residing on the land originally selected by Gwynneth’s father on Redhill Road.